A mouth-blown glass cloche serves as both a striking display piece and antique accessory. Each one is made in Hungary from vintage wine bottles, and every element of it is salvaged—from the glass to the recycled tin trim to the wood stopper. 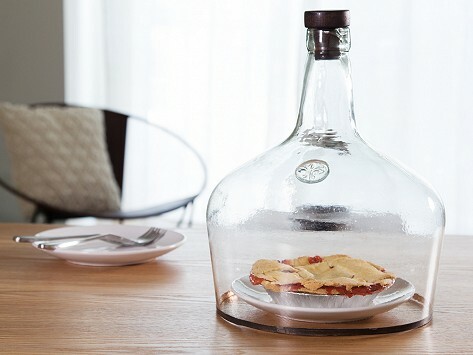 Use one to top off dessert or cheese plates, or as an elegant terrarium. Dimensions: Small: 7" D x 8"; Medium: 11" D x 14"; Large: 14" D x 15"
This was a gift for my sister. It was hard to give away! So pretty and she loves it. I will be purchasing again. I love it! It reminds me of old world charm! Wish it had smooth edge on bottom so it could sit on it's on! Do they by and chance have a tubber ring that goes on the bottom or something round to go with it to keep from scratches and cuts! Thank you for another good co.and great idea!